Asylum interviews at the Dutch Immigration and Naturalisation Service (IND) take place in the presence of an interpreter, to establish communication between the asylum seeker and the IND-officer. 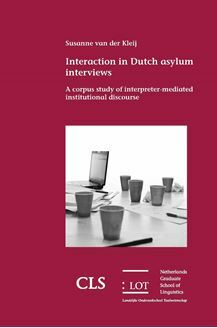 Interpreters are indispensable in asylum interviews, but, at the same time, they add to the already complex institutional communication with asylum seekers. Interpreters are guided by a code of conduct that prescribes the interpreters’ role and aims to guarantee an unequivocal way of performing interpreting tasks in asylum interviews. The interpreter’s role in interpreter-mediated institutional discourse is a core issue in interpreting studies: although there is agreement on the fact that an interpreter can never act as a ‘translation machine’, the question remains to what extent an interpreter should be involved in the discourse. This study contributes to this discussion. The analysis of the data is carried out within a theoretical framework on norms, originating from the neighbouring field of translation studies and adapted to the context of interpreter-mediated institutional discourse. The findings in this study are of relevance to both the fields of translation and interpreting studies and to (governmental) organisations and institutions working with interpreters in institutional domains in general.